Before we delve into the making of Tobias Hutzler’s Balance, we offer our sincere thanks to Time for featuring the film last Friday and B2Pro for supporting the production. Within two days, Balance racked up close to 50,000 views on Tobias’ Vimeo channel and nearly 2,000 likes. (As of this writing, it has surpassed 70,000 views.) It also has been picked up by online media outlets ranging from Zeit, which is like the Time magazine of Germany, to U.S.-based Juxtapoz. And it was named a Staff Pick by the editors of Vimeo. The inspiration for Balance was Maedir Eugster, an artist with the Rigolo Swiss Nouveau Cirque, who performs the astonishing feat of balancing a series of palm-leaf ribs on a single feather for audiences at the avant-garde circus Spiegelworld’s “Empire” show. Tobias, who is interested in temporary sculptures, was introduced to Maedir, and the two decided to collaborate on a film based on the performance. “I am very interested in the aspect of perpetual motion, an object of perfect symmetry, geometry and balance, like a mobile by Alexander Calder,” Tobias says. Rather than try to re-create the colorful staging of the palm-leaf piece familiar to Maedir’s Spiegelworld audiences, though, Tobias took a much more spartan approach and chose a bare studio for the setting. Tobias shot the film at Parlay Studios in Jersey City, New Jersey, using a setup comprising multiple RED cameras, in order to capture “the tension and sweat in detail.” Balance was produced by James Jolly of Prime Pictures, executive produced by Brent Langton of B2Pro, and edited by Bunker Media. “Prime Pictures became involved in Balance after meeting Tobias and loving his idea and passion behind this project,” says James. “Prime is a production company bridging the gap between still photographer and cinematographers. We are able to fund projects like these due to the support of our parent company, B2Pro, and editing division, Bunker Media. 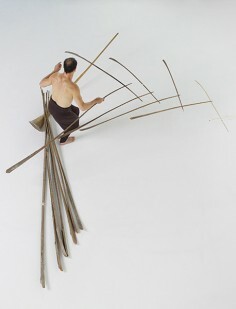 Temporary sculptures, perpetual motion, focus, energy and balance. mandalas are deconstructed shortly after their completion. This is an allegory, done as a metaphor of the impermanence of life. An incredible kinetic sculpture is built of palm branches by the sculptor, it is amazingly held together only by a feather. Tobias Hutzler, a photographer / director based in New York City, creates photographs that showcase sculpture-like forms outlined by live human bodies. The unusual portraits, (because I have no idea of what else to call them) feature men and women in skin toned underwear, posing on top, near, and next to each other in strange, and involved poses. It is interesting to note that Hutzler instructs his subjects to pose in intricate positions with in each other on top of a stand (one that would usually hold a sculpture in a museum/gallery space). This detail further assures the viewer that he/she is indeed witnessing a sculpture of some sort. Hutzler is also interested in portraying ‘different shades of color’, meaning that he includes people of varied skin tonalities, and I assume, different nationalities as well. Hutzler creates these large-scale photographs by using a unique technical approach, resulting in images that are printed as they are shot, without manipulation. Photographing with small-scale digital sensors, Hutzler achieves a distinctive digital noise quality, allowing for the characteristics of raw digital technique to have a powerful effect on the final photograph. Tobias Hutzler is an inventive photographer/filmmaker who presents familiar subjects in striking new ways, with a focus on documenting and portraying contemporary American culture. As an image maker Tobias captures the pulse of our constantly moving and morphing culture. He has been called “visionary” by AD Magazine and “one of the most exciting new artists working in photography.” He is based in New York. Tobias Hutzler is an internationally renowned photographer, director, and artist. He presents subjects in striking new ways, possessing a distinct point of view that has attracted editorial and advertising clients worldwide. He studied photography at some of the most prestigious schools in Europe and received his MFA in the US. He is a Fulbright Scholar and recipient of the prestigious DAAD and European Union fellowships. His work has received numerous international awards and he was named one of PDN’s 30 photographers to watch. “His pictures are both consistent and filled with surprises,” legendary director of photography Elisabeth Biondi wrote of Tobias’ images. As an image maker Tobias captures the pulse of our constantly moving contemporary culture. His work appears regularly in many international publications. He is a regular contributor to The New York Times Magazine, The New Yorker, TIME Magazine and has been called “visionary” by AD Magazine and “one of the most exciting new artists working in photography.” He is based in New York City and represented by Stockland Martel.